Potato cyst nematode (PCN) significantly reduces crop yields, increases production costs and results in trade restrictions. 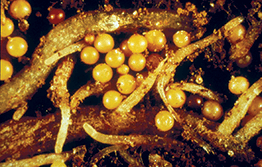 PCN is a microscopic, worm-like organism which feeds on the roots of potatoes, tomatoes and related solanaceous crops. It’s found in Victoria. If you think you have seen plants with symptoms of potato cyst nematode, call 1800 084 881. PCN is spread through the movement of host plants or soil that is attached to plants, bulbs, advanced trees or agricultural equipment.